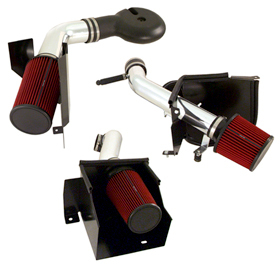 A cold air intake works in a similar way as a supercharger. The more air (oxygen) and fuel you can squeeze into your cylinders on the intake stroke, the more power you can produce from the same displacement engine. One non mechanical way to squeeze more oxygen into the cylinder is to make it more dense by cooling it. Cooling the air as it enters the intake effectively makes it more dense. The computer on your Mustang reads information like temperature,vacuum, air speed and other factors and then alters the amount of fuel at any given throttle position to achieve as close to perfect combustion as possible. It even works on older cars without a computer. Cooler air, denser charge equals more oxygen. Bottom line? An increase in horsepower. Installing your cold air intake takes a few steps. The beauty of buying a kit that is application specific, is that the guess work is taken out of the installation. Step 1. Mark and remove all electrical connectors attached to the stock intake. If in doubt about the connector, I write the name or matching numbers on both sides of the connector so I can get them back in the right place after installing the new intake. Step 3. Unbolt the plastic housing from the frame, and gently pull out the intake tube (snorkel) and housing from the inner fender. Set aside all bolts and grommets for future use. Step 4. Disconnect any hoses. Unscrew the hose clamp on the throttle body and gently tug it away to remove it. Step 5. Attach the small rubber tube onto the front of the throttle body and slide on the hose clamps, Tighten only the one closest to the throttle body for the moment. Step 6. Remove the air intake sensor from the old rubber tube and transfer it to the fitting on the new cold air pipe. Step 7. Install the long chrome tube with the sensor now installed into the rubber tube on the throttle body and turn it to make it fit properly. Step 8. Attach any small hoses removed earlier, to the fittings on the new intake tube. Step 9, Remove the Mass Airflow Sensor from the old housing. Step 10. Using the provided hardware and gasket, attach the sensor to the new housing. Step 11. Install the angled plate onto the front of the tube. Then slide another clamp onto the front, attach the new air filter by placing the clamp over the rubber housing and tightening it till just snug. Step 12. Attach the angled plate to the inner fender. Step 13. Attach the Mass airflow sensor to the long tube. Step 14. Make any minor adjustments for fit and tighten all the clamps securely. Make sure all connectors are secure, all hoses are firmly into place and any unused holes plugged if necessary.